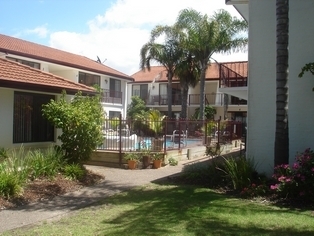 The Peninsular Merimbula is a family friendly complex situated in a tranquil setting in the Fishpen area of Merimbula. The spacious two bedroom apartments overlook a solar heated swimming pool. The apartments also have TV, DVD and free Austar. There is a large BBQ and playground area. The surf beach is only a two minute walk and the main shopping area is a 15 minute walk. 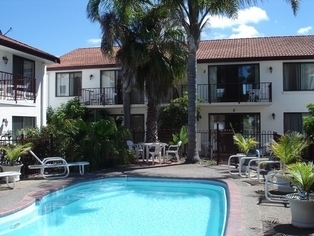 *2 night special* Spacious fully self contained apartments with fully equiped kitchen, microwave and dishwasher. Laundry and dryer in apartment. Room overlooks solar heated pool. Linen included. 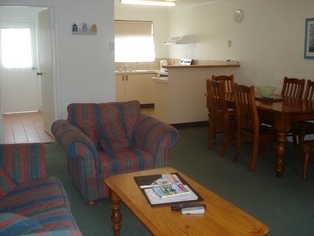 *3 night special* Spacious fully self contained apartments with fully equiped kitchen, microwave and dishwasher. Laundry and dryer in apartment. Room overlooks solar heated pool. Linen included. *5 night special* Spacious fully self contained apartments with Fully equiped kitchen, microwave and dishwasher. Laundry and dryer in apartment. Room overlooks solar heated pool. Linen included. 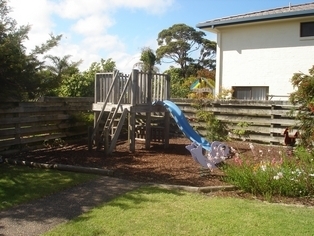 *7 night special* Spacious fully self contained apartments with Fully equiped kitchen, microwave and dishwasher. Laundry and dryer in apartment. Room overlooks solar heated pool. Linen included. The apartments cater for up to five guests. Extra guests attract a charge of $5.00 per person per night. There is ample off street parking for both cars and boats. Swimming, surfing, fishing golf and bowling. A good choice of restaurants and cafes.